This week has been nonstop action and work as several books get closer to being sent to the printer. It has been a lot of long hours, but worth every minute. Whew, read all about it while I sit back for a minute to catch my breath. UPDATE: Online Sales – at last, some good news. Online sales were solid over last weekend and steadily climbed throughout the week to give us what was looking like the best week of sales in a long while. Then the bottom dropped out this morning. Depending on overnight sales, Palladium should still see a good week, but this morning’s were pitiful. I had hoped we were through the slump and sales would keep going up or stay strong from this point forward, but it seems the roller coaster ride continues. Oh well. 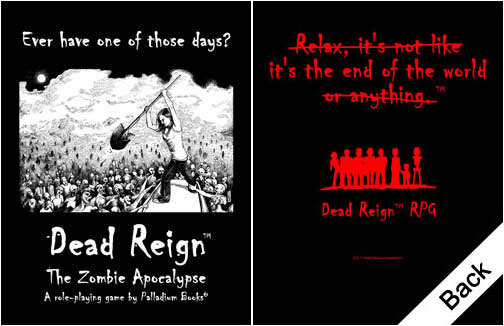 The good new is that, overall, sales have picked up and Palladium has been seeing a little of everything selling: Back stock titles, pre-orders for upcoming releases, bookmarks, zombie prints, T-shirts and especially Christmas Surprise Packages. Half our sales this week were Surprise Packages. I guess all I can say is, keep ‘em coming. New books at last! Two books out by the end of November. Two or three more in December. UPDATE: Robotech® New Generation™ Sourcebook – Progress is made! 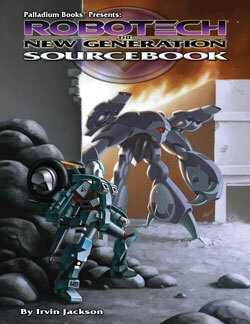 Approvals are in, and as you read this, Wayne Smith is busy laying out the New Generation™ Sourcebook. When done we send it in to Harmony Gold for final approval. With any luck, we’ll get approval back in a couple days and we can send the book off to the printer next week. We are excited to finally have this book heading for the printer. Keep those pre-orders rolling in, because this sourcebook has a little of everything: Use mecha from all eras of Robotech® in one setting, Veritech Fighters, Hover Tanks, Cyclones, and something called “Frankenmecha” – giant robots combined with the limbs, weapons and body parts of two or more mecha – rules for creating Frankenmecha, new weapons, new vehicles, seven new resistance fighter O.C.C.s, Invid Hives, key characters from the TV show, world overview, great art and more. And, due to popular demand, it is in our usual 8½ x 11 book format. Ships November 28. UPDATE: Rifts® Path of the Storm™ – One writer’s vision for the Rifts® Movie – is also ready for layout. As soon as Wayne is done with Robotech® New Generation™, he jumps into laying out Rifts® Path of the Storm™ and off it goes to the printer. Chuck Walton has been working on the cover here at the Palladium offices. It is half done and looking fabulous. In my opinion, this may be his best color work to date. I’ve had Matthew write a few additional sets of stats, so there are more NPCs, monsters and villains for game use. The book includes his full screenplay (a fun read), plus an introduction about Rifts® and Hollywood by me, and stats for three new demons, key villains and several heroes from the script. A lot of fun for the holidays. Cat. No. 305, 96 pages. Ships November 28. 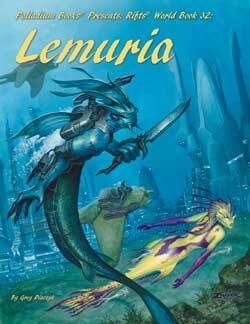 UPDATE: Rifts® Lemuria. I continue to pound away at Rifts® Lemuria. It is packed with information about the Lemurian people, their floating cities, new Biomancy magic spells, Millennium Tree items, aquatic riding animals, sea monsters, sea dragons, sea serpents, living armor and weapons, special powers, and more. There is a lot of great stuff in this hotly anticipated World Book. Getting it finished is my top writing priority. 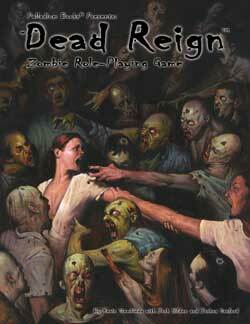 UPDATE: Dead Reign™ Sourcebook 3: Endless Dead™. This is another book that is coming along nicely. We are still waiting for the finished cover, but artist, E.M. Gist says it is his personal favorite of them all, and that’s saying quite a lot considering how great the other covers have been. Much of the interior art coming in is jaw-dropping amazing. Nick Bradshaw is a mad man, and he and Mike Mumah have taken their art to a new level. As for the new source material? Zombies like you have never seen them, 7 new types of them, 5 new survivor O.C.C.s including the Wheelman and Zombie Hunter, vehicle armor rules, many encounter tables, adventure tables, what the military is doing and more. 96 pages of gruesome goodness. At this point, the book is going to slip into an early December release. We’re thinking around December 12. UPDATE: Christmas Surprise Package. $80-$90 worth of product, sometimes more, for only $38 plus shipping and handling. Plus we’ll sign the books if you request it. This is the deal of the holiday season for gamers. All items are handpicked from your “wish list” and if you want them, all books are autographed by available Palladium staff and any freelancers who walk through our door. Get signed books, prints, back issues of The Rifter®, original artwork, T-shirts and other Palladium goodies to fill in holes in your collection, or to try new games settings, or to get collectibles and unusual keepsakes like the bookmarks, staff photo, zombie staff photo, prints, etc. And, of course, to get holiday gifts for your gaming buddies. A great way to celebrate birthdays, anniversaries and other special occasions too. We ship every couple of days (every day as we get closer to the holidays). Take advantage of this wonderful offer and see some of the new products available below. Available only in Surprise Packages! 2011 Palladium staff photograph, signed by the six of us, is available by request in Palladium Christmas Surprise Packages. It has a value of $10.00; included only when people request one. HOWEVER, you can also (or alternately) request the Zombie Staff Photo. 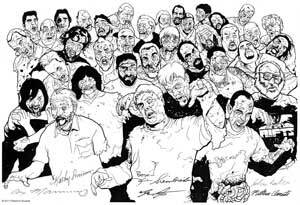 Just for fun, Wayne Smith grabbed the zombie head shots of us from the Mike Mumah black and white art and replaced our real heads in the photo with the line art. The resulting zombie-bobble head appearance was hilarious and we thought some of you might get a kick out of it, so we are making it available in Christmas Surprise Packages. Only people who request either Staff Photo will be considered to receive one. Both have a $10.00 value. 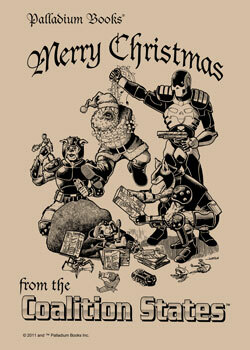 Only available in the X-Mas Grab Bag. NEW! Palladium Bookmarks are available now. Sales and requests in Christmas Surprise Packages are picking up as word spreads. A set of four is only $5.00, and they are fun and useful. 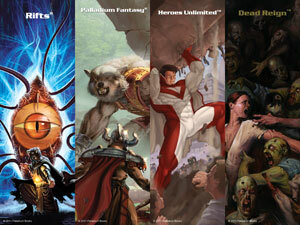 You get a bookmark for Rifts®, Palladium Fantasy®, Dead Reign™, and Heroes Unlimited™. UPDATE: Back in print – soon. There are several books we hope to get back into print, before the Christmas. Rifts® Chaos Earth™: Rise of Magic™ – coming back in print. UPDATE: The Rifts® Game Master Support Kit has been available since late last week from DriveThruRPG.com for $5 and people seem to be enjoying it. By the way, that’s 50 pages for five dollars, so check it out and order your copy today. It includes G.M. reference sheets, Rifts® Combat Matrix, Rifts® Skill List, Alphabetized Spell Sheet, ‘Borg Worksheet, Rifts® Character Sheets, 20 complete, pre-rolled characters for players, and other material that should give Game Masters a nice, solid resource to draw upon to run games on the fly and help in the running of demos and pickup games, as well as personal campaigns. I’ve kept Wayne too busy this week for him to finish the Palladium Fantasy® Game Master Support Kit, but we hope to have it available in a week or two. Meanwhile, Carl Gleba is already working on a Phase World®/Three Galaxies Game Master Support Kit. UPDATE: DriveThruRPG.com offers 90+ Palladium titles as PDFs including The Rifter® #1-48, first edition printings of Rifts®, Palladium Fantasy®, Heroes Unlimited™, BTS, and other game lines, as well as books such as Nightbane® Book Four: Shadows of Light™ and both versions of the The Mechanoids® RPG (1985) and The Collected Mechanoid Invasion® Trilogy (1981-1983), plus the new G.M. Support Kits and sneak previews of various books. The sneak peeks for Rifts® Lemuria, Vampires Sourcebook, and Endless Dead™ will be appearing soon. UPDATE: Palladium Open House, May 4-6, 2012. We want to see you there, so please start making your plans. 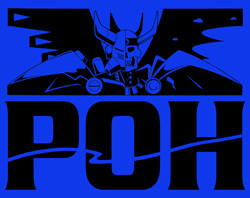 If Christmas is only 44 days away, then the POH is coming up fast. Order your tickets now and start saving to come on over and be part of this truly unique and special gaming event. I mean, you get to meet dozens of Palladium creators, chat, get autographs and game with the very people who made the RPGs you love! And it’s all role-playing games all weekend. I want to make this the biggest POH blowout ever and see a record number of gamers in attendance. See the description of the event toward the end of this Weekly Update. Join the fun. 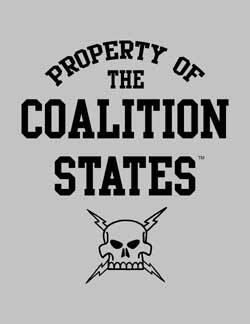 UPDATE: Kevin’s Online Toy & Collectibles Store. Alex and I have been steadfast in continuing to put a lot more toys and action figures into my online store. They might make nice holiday presents. Once a week we also try to add a few Palladium collectibles, art prints, original artwork and out of print books (signed) for our gaming fans. We’ll keep adding toys every day or two and Palladium Collectibles at least once a week. UPDATE: Comic books. Our efforts to create and release comic books based on Rifts® and other Palladium intellectual properties continue behind the scenes. We are very happy where things are going, but don’t want to talk about them too much until we have something to show. Alex is doing great. Alex recently enjoyed more positive news about his medical condition. In short, everything is under control. It is something that has to be monitored and managed for the rest of his life, but right now he’s doing great. Meanwhile, my friend Kay Kozora continues to fight hard in her battle with cancer. We’ll be giving you fuel for your imaginations with 5-6 new game books to close out the year, and with several new titles in the pipeline for quick release at the onset of 2012. Won’t that be nice? During the holiday season, we like to let you see some of the many comments we get with the Christmas Surprise Packages. It’s a nice way to acknowledge some of our fans and to share with you the kinds of words we hear from gamers throughout the season. We show only initials as some people would rather keep their identity private. Our thanks for your kind words of appreciation and encouragement. T.B. in Lawrenceville, Georgia, writes: I really should send you all a picture of our wall ‘o Palladium games. We have been playing in your worlds for years and introducing new players as we can. The current group is up to 12 players, most of which hadn’t ever seen BTS before now. And they are loving it. Thanks again for making our Saturdays all about good times, friends and adventure. M.R. in Littletown, Colorado, writes: Mr. Siembieda, I want to thank you for the games that you have developed. I have only been a player, not a G.M. . . . your games have done two things for us: 1) Kept me and others out of serious and deadly trouble (prison politics) and 2) been a strong part of my recovery (16 years clean). Gaming is a privilege in here. M.L. in Glen Burnie, Maryland, writes: Love the Surprise Package. Can’t get enough of it! Keep up the great work at the studio, keep the ideas coming! S.G. in Curtis Bay, Maryland writes: I’ve always had great enjoyment coming from the X-Mas Grab Bags. I especially love being able to show off the signed stuff to my friends. H.H. in Oberursel, Germany, writes: Dear Santa Kevin & his Elves. ;-) every year since I ordered my first X-Mas Surprise Package I have done it again and again, but I ask myself whether it can actually be worthwhile for you aside from, well, making me and I assume a whole bunch of other fans extremely happy . . . Kindest Regards. S.S. in Tulsa, Oklahoma, writes: This is for my son. Last time I asked, he had around 160 books. He is a big fan of you guys. Thanks for making him happy. N.H. in Rusk, Texas, writes: . . . I do want to say thank you for all the awesome and wonderful games you have put out over the years. I don’t get to play any more (no friends around that play), but most of my life I have been able to enjoy the amazing worlds you created. So again, THANK YOU! A.R. in Fort Collins, Colorado, writes: Palladium has given me many years of role-playing fun. I look forward to many more years. This book is epic in scope and opens up an entirely new range of game play by allowing mecha and characters from all eras of Robotech® in one setting. For the first time ever, Veritech Fighters, Destroids, Battloids, Hover Tanks, Cyclones, and something called “Frankenmecha” – giant mecha amalgamations that combine the limbs, weapons and body parts of two or more mecha. There are also rules for creating Frankenmecha, new weapons and vehicles, seven new resistance fighter character classes, Invid Hives, key characters from the TV show, world overview and more. 8½ x 11 book format (not manga size), 96 pages. 7 new O.C.C.s include the Freedom Fighter, Patcher, Urchin, Pathfinder and Invid Experiments. 96 pages – $16.95 retail – Cat. No. 554. November 28, 2011 release. In final layout stage of production. In addition to Matthew’s Rifts® movie script and RPG character stats, there is some text by Kevin Siembieda about his adventures in Hollywood, as well as some artwork. This is a unique product and a fun read that lets you step behind the veil at Palladium Books. A bit of insight on just one of the many projects that have gone on behind the scenes this year at Palladium. The shirt is here and looks even better than the original version printed on a white shirt back in the 1990s. We tweaked and darkened some the artwork to make it even more dynamic. We have made this shirt affordable so as many people as possible can get one if they want it. 96 pages – $16.95 – Cat. No. 233. December release. $16.95 – 128 pages. Cat. No. 884. December release. The Genesis Pits™ Sourcebook takes a deep look at one of the most awesome and terrifying powers wielded by the Invid: the ability to alter genetic structures and evolve their own species as well as other beings. To that end, the Invid have built massive evolutionary laboratories across the Earth and numerous worlds in an effort to find the perfect form to dominate the universe forever. The sourcebook includes a wide range of mutations, different types of Genesis Pits, new Robotech O.C.C.s and new "Frankenmechs" – hybrid mecha made from the leftovers of Earth's fallen defenders. The Genesis Pits™ Sourcebook goes beyond the cartoon and deep into the machinations of the Invid and their deadly consequences for all who happen into their path. New Frankenmechs, like the Fury (Valkyrie and Queadluun-Rau power armor hybrid). We wanted this truly epic title out in December or January, but February is just a more realistic release date. We sure don’t want to rush a book so many people have been waiting for. We hope you understand. 192 pages – $24.95 retail – Cat. No. 876. February 2012 release. Robotech® New Generation™ Sourcebook – New – November 28. Rifts®: Path of the Storm™ – New – November 28. Another title may be added.